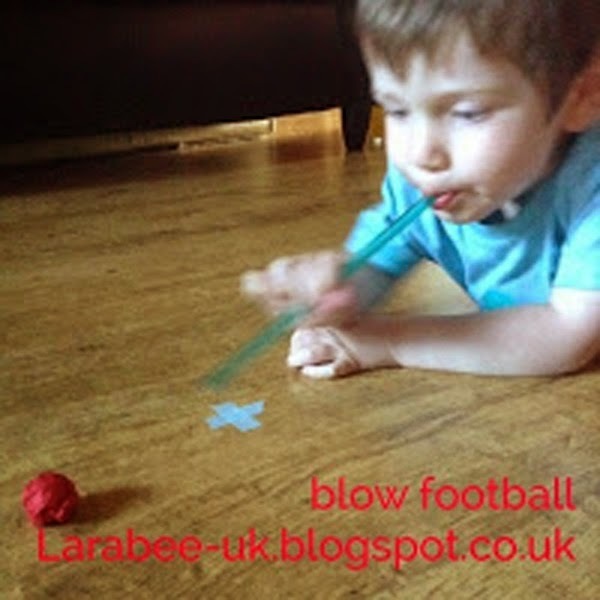 We've been playing a fun blow football game. 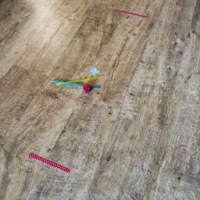 First I made 2 goals using washi tape on our floor, I then made a cross for the centre, this is where our ball will start. Using tissue paper we made a ball, it took us a couple of attempts to get the right sized ball, some were just far too big and we were unable to blow with the straw! 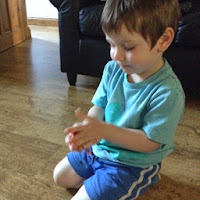 T enjoyed this more than anything, one of his 'next learning' steps from Nursery is for him to learn about size so this fitted in really well, he kept saying, 'we need to make it smaller' and if he made it too small said 'we need to make it bigger' in the end we managed to get a ball just the right size for him to blow through the straw. Originally I had envisaged that we would start off with the ball in the centre and take one blow and see if we could blow the ball into the goal in one puff, but T clearly didn't like that variation of the game and instead blew the ball right up to the goal. If T was a bit older I think I would have created a complete washi football pitch with rules about going 'off pitch' and having someone 'in goal' but we kept it nice and simple this time and had great fun. 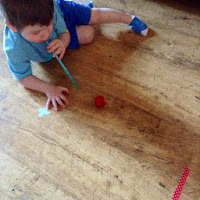 I'm trying to let him determine his own 'rules' at the moment and not try and directed him with my ideas. I'll give him a guide and options but if he comes up with another idea then as long as it's not unrealistic I'm being flexible. I'm really learning with this concept as it really tests my control freak tendencies, although I am learning that it can be a lot more fun changing the rules as you go along and that rules are for breaking! Thanks veena. Super simple - just as I like it! !